Penn State University received a three-year, $800,000 grant from the Energy Department's Nuclear Energy University Program this week to develop a method to reduce the volume of radioactive waste created during nuclear fission. Penn State scientists will study the thermodynamic properties of cesium and strontium in an effort to isolate and remove them from radioactive waste. Leading the project is Hojong Kim, assistant professor of materials science and engineering at Penn State. During nuclear fission, the process used in today's commercial reactors, uranium atoms break up into smaller, unstable and radioactive elements. 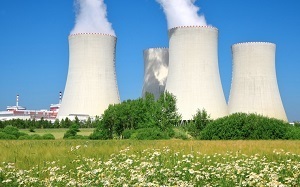 The process releases a large amount of energy in the form of heat, which a nuclear plant converts into electricity. Kim said cesium and strontium are among the more difficult elements to isolate because of their properties. Kim’s team will be using a method called electrochemical separation, which can attract elements based on properties in physical and chemical forms. Current spent-fuel disposal methods utilize electrolyte solutions, also called baths. Cast-off elements in such a solution prevent future use of the solution for other fuel assemblies. "The easiest way to address this may include refreshing the electrolyte bath, but this will result in an excessive amount of useful electrolyte being wasted and increased operating costs,” Kim said. “Furthermore, these electrolytes need to be mixed with glasses for safe, long-term nuclear waste disposal, creating a large volume of nuclear waste." The first stage for the team will be to determine the thermodynamic properties for electrode elements that would allow the removal of cesium, strontium and barium from spent electrolyte baths.